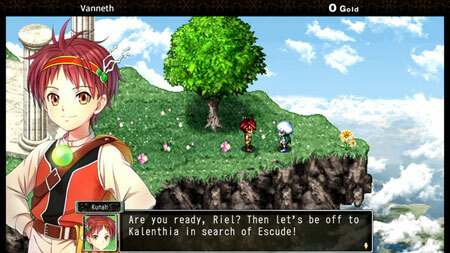 Frane: Dragons’ Odyssey is an anime RPG adventure game developed by ExeCreate Inc. Set out for in search of a missing girl and venture out. Take on enemies by making use of weapons and magic in different situation in quick-paced action battles. Kunah is a boy from the fire dragon tribe, one day he is summoned by the god that reigns over the world above. He is told to bring Escude the lost girl from the angel clan back to Vanneth. With his childhood friend, Riel, the daughter of the ice dragon chief, he follows after the missing girl and sets out for the vast world below the clouds only to find mysterious and fun adventures. Explore dungeons, craft items, upgrade weapons, cook dishes and enjoy your quest with a variety of original and colorful characters awaiting during your adventure. If you get stuck in the game, check out the video walkthrough and gameplay for the game. This entry was posted in PC Games, Walkthrough and tagged Frane: Dragons' Odyssey Cheats, Frane: Dragons' Odyssey Gameplay, Frane: Dragons' Odyssey Guide, Frane: Dragons' Odyssey Strategy, Frane: Dragons' Odyssey Walkthrough by Marvin. Bookmark the permalink.